Hi there, my darlings! I hope this Monday afternoon hasn't been too much of a drag for all of you...as it has for me. Sigh. But, in order to cheer myself up, and you too if your day's going like mine, I have a special review of a specially curated brand from one of my especially favorite indie brands--I'm talking about the specially curated by yours truly Fun in the Sun box from ellagee! Now I LOVE Laura and when I recently expressed a desire to have a couple of fun Instagram giveaways, Laura rushed to my side...as always! She's not only a great indie maker but she's a great friend and it's always a blast putting together these kind of things with her! Let's take a peek at what this box contained and how I felt about each of them! First, we wanted to make sure this box had everything you needed if you were traveling (as I will be shortly), whether it was on an extended vacation or just a weekend away. So, you HAVE to have a good base coat, a good top coat and a good cuticle oil, right? Yup! And Laura took care of all three in this box with her Smoothing Base Coat, her Fast Dry Top Coat and her Orange Blossom cuticle oil.. I must say I REALLY love the base coat, so much so that it's displaced my Orly Bonder during all swatches--now that's big! What about the cuticle oil? I like it. I find the scent to be a bit too mild for my liking and it doesn't last for as long as I would prefer. But it moisturizes very well without being in the least greasy--perfect for when I'm swatching! Next, this little box contained a custom, mini polish bottle keychain which has become a signature of Laura's. Each winner was able to pick out the charms they liked best and then Laura assembled it to those specifications. When it came my turn, I asked to make me something she thought I would like...and she hit the nail on the head! Look how pretty and sparkly mine is! Now, let's talk about the polishes in the box! I picked two of my very favorite ellagees. First, Plum Gee-nius--A GORGEOUS blackened plum holo that Laura created exclusively for members of her Facebook fan group. You can see my review of this beauty HERE. The second polish I picked is Life is De Bubbles--a gorgeous, bright sea/aqua baby jelly polish with transparent pink, blue, purple, and iridescent circle glitter and...silver holographic DOLPHINS! Oh my! I love these dolphin glitters SO MUCH! 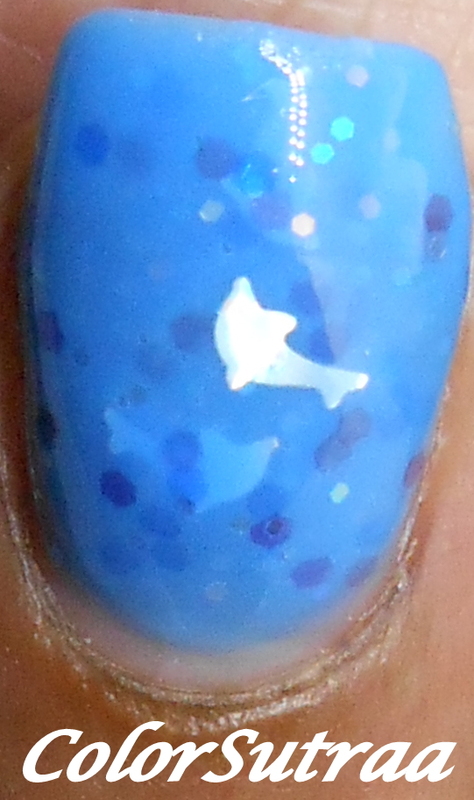 And the best part has to be the formula and application of this polish--smooth without being streaky or clumpy, opaque in 3 coats and the glitters, even the dolphins, came out easy-peasy. No muss, no fuss and the swatches below show 3 coats, topped with 1 generous coat of her Fast Drying Top Coat. Such a fun, pretty polish! So there you have it, my darlings! My custom Fun in the Sun curated box with ellagee! Although this box was specially curated for our giveaway, you can pick most of these products individually HERE. Remember to follow Laura of ellagee on FACEBOOK and INSTAGRAM for all the latest updates and info! What do you think of this curated box? Would you be interested to see more such curated boxes in the future? I'd love to hear from you in the comments section below!